One of our favorite designers and tastemakers is Barb Blair, founder of Knack Studios so we are thrilled to be talking with her today. Barb not only transforms old furniture into new pieces for modern homes, she gets our mantras of "buy what you love" and "every home tells a story." 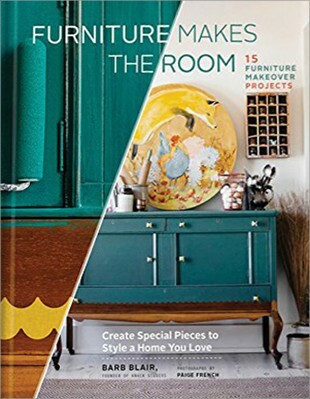 In her new book, Furniture Makes the Room, she shows you 15 furniture make-overs AND how to use each piece of furniture in three different settings. Barb is all about "shopping your home" when looking to refresh a space. Taking something that was in a child's room and moving it to the den, taking a coffee table and putting it at the foot of the bed, or bringing an outdoor piece inside.